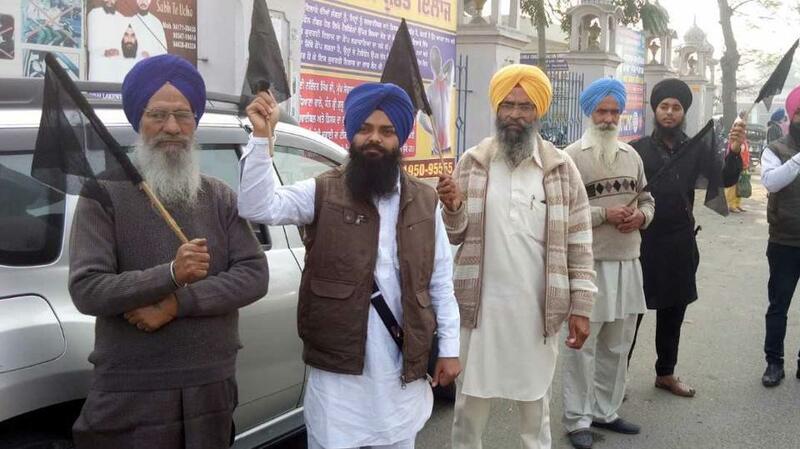 Activists of the United Sikh Party (USP) showed black flags to newly elected president of Shiromani Gurdwara Prabandhak Committee (SGPC) Gobind Singh Longowal during his visit to Gurdwara Dukhniwaran Sahib in Patiala on Friday. Jaswinder Singh, a main activist of the party, said it is unfortunate that Longowal was elected as SGPC president, as he was a ‘tankhaiya’ (guilty of religious misconduct) by the Akal Takht, the highest temporal seat of Sikhs, and underwent punishment for visiting Dera Sacha Sauda during Punjab assembly elections. “Longowal’s appointment has deeply hurt sentiments of the Sikh community and we will not accept him as SGPC president,” he said. He added that the SGPC elections have been politicised completely and Longowal was elected president for ‘political gains’. Meanwhile, Longowal completely ignored media queries over the tankhaiya issue and even skipped a press conference at the gurdwara premises. Before paying obeisance at the gurdwara, Longowal met his predecessor Kirpal Singh Badungar at the latter’s residence. Longowal said the former president had made all possible efforts to promote Sikhism among masses, besides taking care of SGPC affairs in a progressive manner. He said the meeting with SGPC officials and members will held soon to draw a blueprint for completion of pending works, besides streamlining working of the committee. Prominent among those present on the occasion were member of Parliament (MP) from Anandpur Sahib Prem Singh Chandumajra, senior SAD leader Surjit Singh Rakhra, MLA from Sanaur Harinderpal Singh and others. Mohali: SGPC chief Longowal visited Mohali and stayed away from answering Panth-related queries at Gurdwara Amb Sahib. When asked, he said Guru Gobind Singh Parkash Utsav should be celebrated on December 25 or January 5. Nothing has been decided so far, he said. He was also asked about bringing transparency to the appointment of jathedars, to which he did not respond.